(Abuja, April 16, 2018:)Flight Lieutenants Jerreck Jeff Dwanah and Varney Adolphus Sirleaf are the first two pilots of the Armed Forces of Liberia (AFL) in post-war Liberia. A release from the Liberian Embassy in Abuja says a winging ceremony for the two AFL personnel and 12 other officers of the Nigerian Air Force (NAF) was held at the Headquarters of the Nigerian Air Force in Abuja on Monday, April 16, 2018. The total of 14 graduates recently completed their basic flying training at the International Aviation College in Ilorin, Nigeria and Afrika Union Aviation Academy in South Africa respectively. Liberia’s Ambassador to Nigeria, Professor Al-Hassan Conteh and Liberia’s Defense Minister, Honorable Daniel D. Ziahkahn, Jr joined several high profiled Nigerian Air Force and Defense personnel for the winging ceremony that officially certificated the twp pilots from Liberia and 12 others from Nigeria, the release says. Minister Ziahkahn, who served as a special guest at the occasion, said upon the return to Liberia, the two Liberian pilot-officers “will form the nucleus of the Liberia Air Wing”. Appreciating Nigeria’s pivotal role played during the Liberian Civil War, the Liberian Defense Minister, on behalf of President George Manneh Weah and the Liberian people, said: “Nigeria contributed troops, provided logistics and equipment and your troops paid the supreme price which helped in restoring peace in Liberia……The Government of Liberia remains indebted to the Federal Republic of Nigeria for your wonderful supports”. Earlier, Nigeria’s Chief of Air Staff, Air Marshall SB Abubakar thanked Liberia for the confidence it placed in Nigeria that allowed the Federal Republic to train the post-war country’s first pilots. “That’s a demonstration of the strong ties between our two countries”, Air Marshall Abubakar added. He also charged the graduating pilots to be prepared for the tasks ahead as they fit into the flying environment: “I urged you to not forget the 3D’s: Drive, Discipline and Desire”. 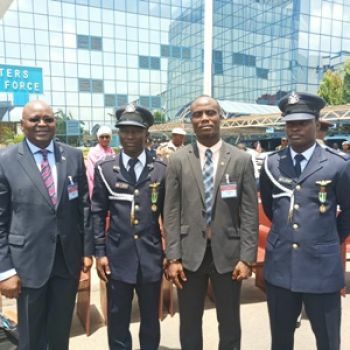 Flight Lieutenants Jerreck Jeff Dwanah and Varney Adolphus Sirleaf graduated from the Nigerian Defense Academy in September of 2013 as members of the 60th Regular Course. On graduation, they commenced initial pilot training at the Nigerian Airforce 301 Flying Training School in Kaduna, Nigeria. When the two Liberian military personnel ended their training in October of 2015, the Liberian Government made a passionate appeal for further commercial pilot to train the two officers to which the Nigerian Government agreed and committed finances and trained them, the release concludes.